Woods Golf Course and Delbrook Golf Course. 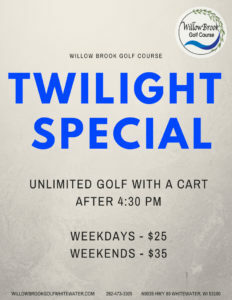 This means that either of these two golf courses may be played by full members for $20.00/round and includes a cart rental. 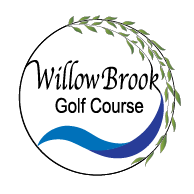 (Please note that Delbrook does not allow reciprocal play before 1:00 pm on Saturdays and Sundays) When you call for a tee time, you will just need to let them know that you are playing as a reciprocal and you will also need to present your Willow Brook Membership card to them upon check in. $2.00 Discount per 9 for Seniors(62), Active Military, and College Students.